Quick WiFi Setup via iPhone or Android Smartphone: SHIELDeye indoor camera is a home camera which connects seamlessly with your home network in a few steps. Simply download our app (SHIELDeye) onto your iPhone or Android device and power on the camera to start. Pan & Tilt and Motion Detection Recording: With the ability to pan and tilt up to 350 degree, you'll have peace of mind knowing you can monitor every direction of your home for your babies, pets, elders and anything you care. Motion tracking technology automatically tracks and records any moving object within the camera's field of view while alerting you on your mobile device. It also utilizes the storage room for your devices. High Quality Video & Wide Viewing Angle: Keep track of anything or anyone you care in crisp and vibrant detail as the wireless camera streams video High-Definition video. Never strain your eyes or play the guessing game again! The home indoor network camera comes with 105 degree wide viewing angle to ensure that you'll see an entire room of your home in crisp, vivid detail with no dead corner. Instant Interaction with Two Way Talk: The wireless IP camera comes with two-way audio. It utilizes an embedded speaker and microphone. Combined with noise cancelling technology, everything heard and said will come through clearly and instantly. Day and Night Surveillance: The outstanding day and night camera allows you to view and protect your home even in total darkness. The camera comes equipped with 8 IR LEDs that provide 16 feet of night vision. View More In Cameras & Monitors. 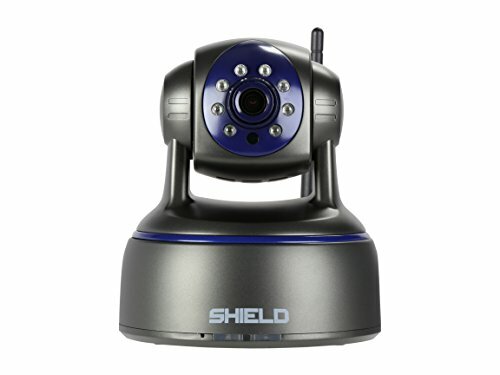 If you have any questions about this product by SHIELDeye, contact us by completing and submitting the form below. If you are looking for a specif part number, please include it with your message.